As of 31 December 2018 Sandvik’s share capital amounted to 1,505,263,107.60 SEK represented by 1,254,385,923 shares. According to the share register, Sandvik had about 101,000 shareholders as of 31 December 2018. AB Industrivärden was the largest owner with about 12.1 percent of the share capital. Of the total share capital at year-end, about 35 percent was owned by investors outside Sweden. The General Meeting of Shareholders is the highest decision-making body. At the Annual General Meeting, the shareholders are given the possibility to exercise their voting rights in relation to, for example, the Annual Report, dividends, election of the Board and appointment of auditor, and other matters stipulated in the Companies Act, the Articles of Association and, where applicable, the Code. All shares in Sandvik carry equal voting rights with one vote per share. 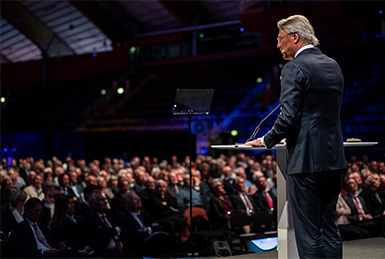 Sandvik’s Annual General Meeting 2018 was held at the Göransson Arena, Sandviken, Sweden. Re-election of Board members Jennifer Allerton, Claes Boustedt, Marika Fredriksson, Johan Karlström, Johan Molin, Björn Rosengren, Helena Stjernholm and Lars Westerberg. Re-election of Johan Molin as Chairman of the Board. The next Annual General Meeting will be held on 29 April 2019 in Sandviken, Sweden. More information is available at home.sandvik.